Overwing: Mottled Ringneck Pheasant feather, cemented and trimmed (Gartside style). Note: Steeves' original recipe calls for mottled turkey. I first saw this pattern in an ancient "Fly Fishing America" article that Harrison Steeves wrote titled "Terrestrials 101" (I'm not sure which issue - I just have the pages with that article torn from the original magazine). There was no pattern, just a photo. 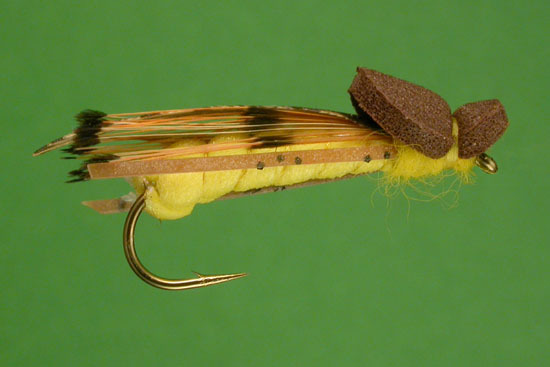 I learned later that Harry tied the fly on one of those living nymph hooks like he does for his UFO pattern, but I just used a straight hook on mine. The fly was also shown on the "Hoppers" video, part of his 4 video set devoted to his terrestrial flies. 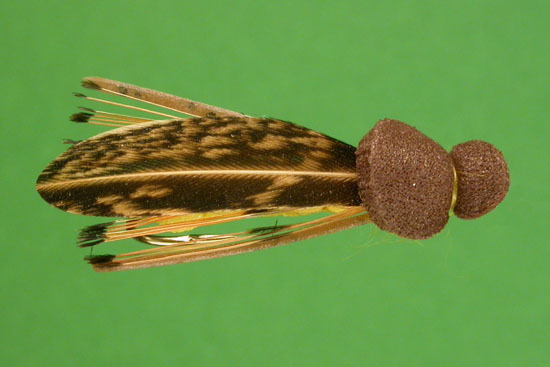 In his book "Tying Flies with Foam, Fur, and Feathers", he changed the name of the fly to "Flying Hopper", but it is essentially the same pattern but with chenille underbody.